Home » Two ladies of Siena. 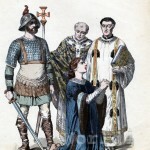 Italy 13th century fashion. 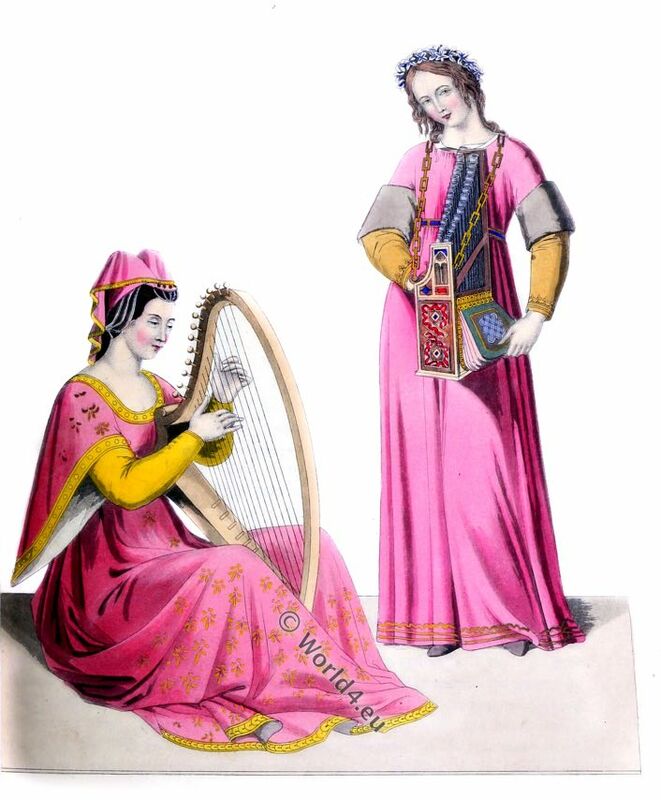 The costume of the ladies, in particular, was there extremely light and graceful. Our plate represents two ladies of Siena, in the costume of the beginning of the fourteenth century. They are both playing upon musical instruments. Music and dancing were the constant and favourite amusements of the Italians at that period. The lady playing on the harp is taken from a picture representing the Triumph of Petrarch, preserved in the Academy of Fine Arts at Siena. It is the work of A. Vanni (1), a painter of that city who flourished at the period just mentioned. 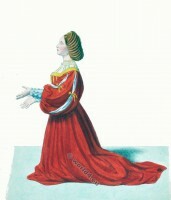 The young lady with the portable organ, is also taken from a painting at Siena, by Domenico Bartoli, who lived at the beginning of the fourteenth century at that place, and who was one of the first distinguished members of a family in which artistical talent descended through several generations. This girl, whose dress is remarkably graceful, is one of those damsels who attended festivals and parties of pleasure to amuse the guests by their performances. She has on her head a characteristic crown or garland of flowers. The instrument on which she is playing with one hand, while she moves the bellows with the other, was very common in Italy at this period. A similar organ is represented in the celebrated picture of St. Cecilia by Raphael. In our initial letter, we come again to the costume and mode of thinking of the west. 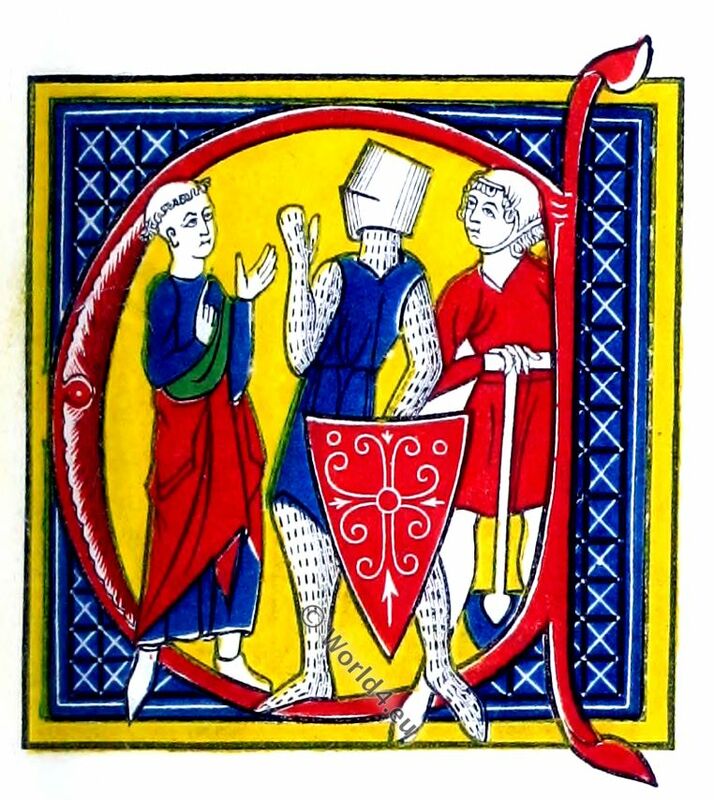 It is taken from a fine manuscript of the beginning of the fourteenth century (MS. Sloane, No. 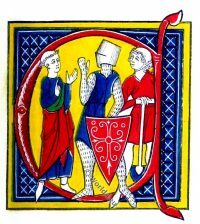 2435), containing the once popular poem by Gautier de Metz, entitled the Image du Monde; and represents the three classes or castes of society acknowledged by the Middle Ages in England, France, and Germany,—the knight or soldier, the clerk or scholar, and the husbandman or labourer. 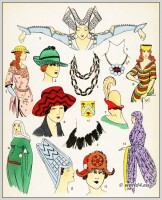 The costume of each class is exhibited with great nicety. The following passage of the Image du Monde (a poetical treatise on general science) is that to which our initial forms the illustration, and sets forth the doctrine of our forefathers on this subject. 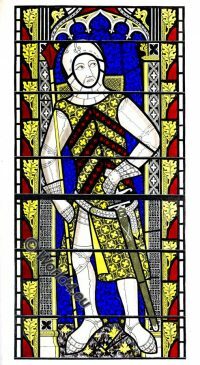 Clerks, knights, and labourers of the ground. By which he loses his grace. Of men there after them. (1) Andrea Vanni (also Andrea di Vanni d’Andrea Salvani, born about 1330 in Siena, died October 2, 1413) was an Italian painter and politician in Siena. 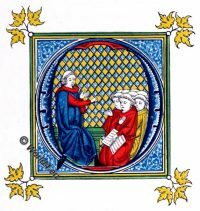 Andrea Vanni was first mentioned in writing in 1349. Vanni was influenced by Simone Martini and the brothers Ambrogio and Pietro Lorenzetti. Vanni belonged to the circle of friends and pupils of St. Catherine of Siena. In 1353, he and Bartolo di Fredi founded his own work of art (Bottega). Since 1355 he was a member of the Guild Arte dei Pittori in Siena. 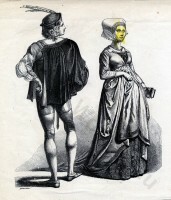 German Citizens in Gothic fashion. 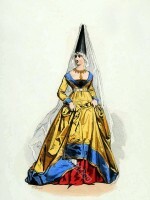 15th century costumes. Carolingian Knight in armor, Bishop, Priest and Burgess. 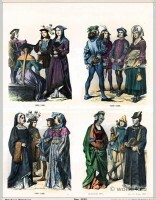 French medieval costumes. Charles the Bold.